A Reading Life: What a difference a day makes . . . 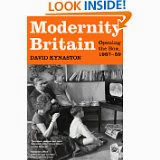 I'm reading with great pleasure David Kynaston's Modernity Britain: Opening the Box 1957-59. There is a particular fascination in reading about the period when one's parents were young and I have been gripped by Kynaston's encyclopedic account of just two years in the 1950s, as I was by his earlier work, Family Britain, dealing with the years just before. I plod on gamely through the sections on the economy, but what really interests me are the details of everyday life: what people were watching on the TV (Cheyenne, Dixon of Dock Green, Double Your Money, The Army Game and Emergency-Ward 10) and listening to on the radio (Hancock's Half-Hour - bliss - The Archers, Mrs Dale's Diary and Woman's Hour). Harold Pinter's The Birthday Party bombed and A Taste of Honey by the young working Sheila Delaney got very mixed reviews (Noel Coward hated it). My Fair Lady was a success. New books included The Darling Buds of May and Room at the Top. These were the years of CND and the first Aldermaston March, the Munich Air Disaster, and Sputnik. The big debates were around modern architecture - to build high or not - and comprehensive education. Which? Magazine reflected the rise of consumerism as did new woman's magazines now in colour like Woman's Realm and Woman's Own. I like to know that it was 6 July 1957 that Paul McCartney and John Lennon first met at a church fete. Modernity Britain is full of this kind of detail and I'm looking forward to next volumes as this is part of a series projected to continue to 1979. Labels: David Kynastion, Modernity Britain: Opneing the Box 1957-59.